My husband’s question caught me off guard. I pondered the possibilities. Finally, I knew what I desired: A trip home to see my family. Living several hundred miles apart from my family for over three decades has been more difficult than I thought it would be, especially after having children. Through the years they’ve missed out on the experience of aunts, uncles, cousins and grandparents cheering them on at games and performances and developing a close relationship with far away family. Although I’ve worked hard to stay connected through the internet, mail and phone calls, nothing compares to being up close and personal. To my surprise and delight my husband handed me an airline confirmation from frequent flier miles he had accrued and exchanged for my ticket. A week later I boarded a flight bound for Missouri. Within a few hours my plane landed and I steered my rental car to my younger brother’s home to visit his family for the weekend, then headed towards the small rural town where I grew up and many more relatives still lived. I’ve always felt welcome and secure there. But mostly it’s a place where I feel loved by the people. As I drove through the familiar countryside and across the bridge into town, childhood memories flooded my mind of wading barefoot through Castor River, pumping gas at my dad’s station, and eating candy at my grandpa’s store. I cruised by my aunt and uncle’s home, and recalled visits and Dr. Pepper. Across the street from their house, is my mom’s. 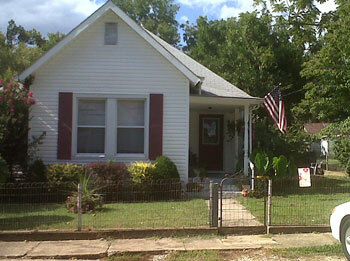 Her quaint home with a lush yard scattered with hummingbird feeders, sports a front porch and an American flag. Although her health is fragile she is still known for her tasty cooking. Sure enough, I opened the door to her home and was greeted by the aroma of stew, red velvet cake and fresh brewed hazelnut coffee. My timing was perfect to help her finish icing my birthday cake, eat a slice and join her to watch a televised St. Louis Cardinals Baseball game. Over the next few days I enjoyed the gift of being home and spending time with family in a variety of simple ways from drinking coffee with my dad, enjoying a birthday dinner at my brother’s to watching my great nephews play soccer. I’m grateful for my birthday gift of going home. The experience was meaningful, added more memories and filled my heart. What gift have you given or received that has been meaningful or priceless? I’d love to hear. One Response to "A Gift of Going Home"
I, too, have lived far away from the home where I grew up. My husband and I have moved several times and as I get older I miss home more than ever before. My dad died this year so going home is even more precious now, so I can see and help my mother. Going home is always a gift no matter when it is given.